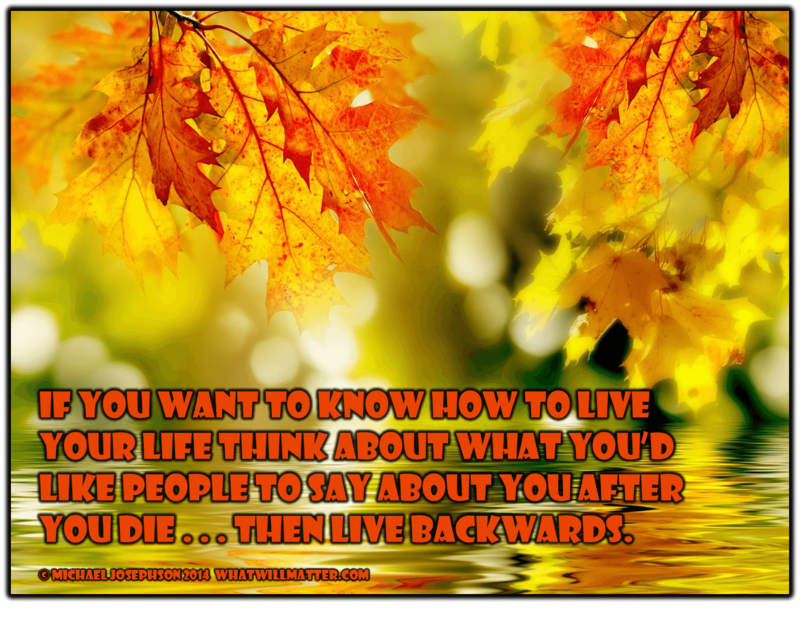 There’s an old saying, “If you want to know how to live your life, think about what you’d like people to say about you after you die . . . and live backwards.” The idea is that we earn our eulogy by our everyday choices. This is Michael Josephson reminding you that, in the end, character counts. I wonder if Ben was from New York City! JB – what was the point of your comment? Disgruntled against all New Yorkers that day? Was this in some way supposed to enlighten us to the topic at hand? Or are you simply just so bored you go from site to site making nonsensical comments to give yourself a thrill. You must be a very sad person, I pity you. Today I will pray for you to be a happier, better person. And I will pray that you become less judgmentsl. Thank you, Jim. There is more than one way to interpret most things. I’m not a pitiful person. I’m blessed with the many abundances of life! I don’t do the things that JVF implies that I do. And I don’t go around praying for everyone else to straighten up and be more like me. I have enough to pray for if I just pray to be a better person myself. I think Mr. Josephson’s message is right on target. It is easy to live your life doing mischief and creating chaos, it is much harder to live your life as though it is your last day and you want to leave the world a better place. Your life is like gold, spend it wisely. I have always liked Steven Covey’s advise to write your obituary today and then begin to live it today, (or something like that).